Kimmel lauded the vice president's knack for public speaking blunders, throwing together a montage of Biden's best gaffes. On Wednesday’s edition of "Jimmy Kimmel Live!," the late-night host wasted no time razzing Vice President Biden on his public speaking gaffes. 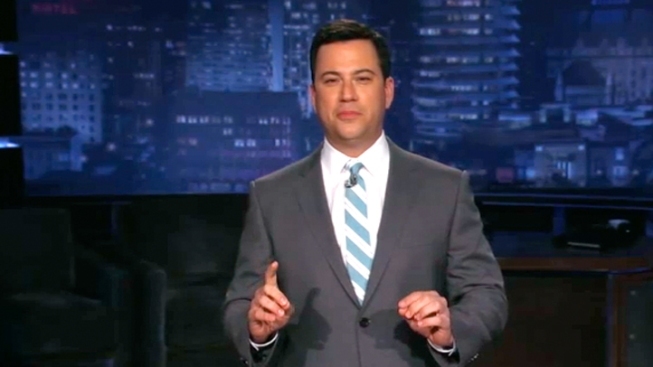 “I think dirty jokes should be an official duty of the Vice President,” Kimmel said in his opening monologue, referencing Biden’s recent address to the National Council of La Raza in Las Vegas. On Tuesday, Vice President Biden addressed a gathering of 1,800 Latino activists, telling them about his upbringing in a multigenerational household. Kimmel, lauding the vice president’s knack for saying “nutty things when he speaks in public,” joked that Biden started putting his hidden talent to good use. Including clips of Biden’s “big stick” remark to his “three letter word” blunder, Kimmel hit his point home that perhaps jokes really should be an official duty of the Vice President.